I can’t remember now if it was Litlove or Rohan who caused me to put Salley Vickers’s Dancing Backwards on my reading list, but I’m glad one of them did because based on this cover and the premise I never would have accepted a copy of this to review, and it would have been my loss. The cover and description led me to think this would be a predictable shipboard romance novel, albeit one focused on an older woman and (perhaps?) a younger man. Not necessarily a bad book, but not a very interesting one. 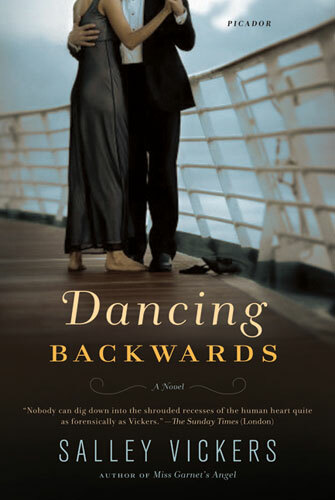 As it turns out, Dancing Backwards isn’t a romance at all, and it’s much more interesting than I would have expected. The story begins with recently widowed Violet Heatherington boarding a ship to travel across the Atlantic to visit her old friend Edwin who lives in New York. During the journey, Vi mixes with others on board the ship, takes a few dance lessons, and spends a lot of time reminiscing about her long-ago friendship with Edwin and the circumstances that led to her first and then her second marriage. Of the many tyrannies which constrain us, Vi thought, it is extraordinary how pervasive are those that persuade us to follow other people’s notions of what we want rather than our own desires. It was easier to give in to Renato than to resist. But that had been her life’s strategy. In matters such as going to a dance lesson, giving in is not a big deal, but Vi has given in to the point where she ended up in a disastrous marriage that she knew was doomed before it began. It’s just that she let others’ voices take precedence over her own. Living life in this way is far more difficult in the long run than a more assertive or even selfish approach would be. Dancing backward, being the follower—as women often have been expected to do—is dangerous! Vi’s suggestibility and resultant way of living raises questions about identity and influence and how we become who we are. One of Violet’s friends convinced her that she was a gifted poet before she’d even thought to write poetry, and she went on to be published and win prizes. Did he see something that was already there, or did his suggestion cause her to become what he suggested? Another characters studied Vodun and kept a purse-like object that he said could contain a person’s soul; it’s not clear what that means to him or to Violet, but it feels sinister. Influence can go either way. This is a novel without a lot in the way of plot. Plenty of things happen, but they’re minor things, especially in the present-day storyline. A subplot involving a lost ring struck me as a silly way of adding conflict that never quite panned out. On reflection, however, I think we’re meant to see something in that story about people’s perceptions and expectations of one another. I’m intrigued by the fact that late on the boat trip, the dances become more free-form and less reliant on partners. Does this represent some push toward independence on Vi’s part? I’m not sure the final events of the novel bear that out, but it’s something to consider. I also wonder if there’s something more in the depictions of other people on the ship with Violet. Are their actions toward her governed by the way she sees them? How does the idea of suggestibility affect our perceptions of others, and how do those perceptions affect the way people treat us? It’s entirely possible I’m overanalyzing, and I’m not sure this is the kind of book that stands up to this degree of scrutiny. But the skillful attention to Vi’s character makes me wonder. Surely the other characters aren’t just window dressing. At any rate, this is a book that reads like light fiction but has some uncomfortable issues at its heart. I could see it fitting in quite nicely among the Persephone and Virago books so many of my blogging friends enjoy. It was a pleasure to read. Interesting sounding novel which I’ve never heard of though I seem to remember reading others by this author. Thanks! The implication here seems to be that ‘dancing backwards’ implies following rather than leading, which of course in one sense it does. But my own interpretation of Ginger’s wonderful remark is that it’s actually a lot more difficult to dance a la Astaire if you are doing it backwards in high heels, so in fact she’s saying she was actually better than Fred (if you see what I mean)? I’m sure you’re right about Ginger’s comment, and I think there’s an element of that here. Vi’s life is much more difficult because she accepts the role expected of her, so she’d have to be better than the men if she were to surpass—or even equal—them. Vi’s no Ginger Rogers though, and the men in her life are no Fred Astaires, so it doesn’t work out so well. I’m so glad you enjoyed it! What I recall primarily about this book is that I read it on a blogging break and never wrote a full review (could easily have mentioned it, though, as I did love it). So my memory of events is pretty hazy. Your lovely review makes me want to go back and read it again – which I would willingly do. You did mention it briefly in the post that I linked, and I imagine that contributed to my willingness to read it. I think it would stand up to multiple readings because there’s so much under the surface. I haven’t read this one (although that quote about Ginger Rogers is one of my all-time favorites), but, based on your review, I obviously need to get this book. I loved both Vickers’s INSTANCES OF THE NUMBER 3 and MISS GARNET’S ANGEL. In fact, I actually cried reading the last chapter of the MISS GARNET book. Like DANCING BACKWARDS, you think it’s going to be about one thing (in this case, a spinster spending a few weeks in Venice) and it ends up being about something else entirely. Anyway, if you haven’t read either of these, I’d strongly recommend them. I haven’t read either of those, but I’m definitely interested in reading more Vickers so thanks for the suggestions. I’m surprised that she isn’t read more! I picked up Miss Garnet’s Angel on my recent trip to the UK (couldn’t seem to find it locally) and am quite looking forward to it after my own good experience with this one. As you say, it looks like a slighter book than it is–it is not a difficult book, but definitely a thoughtful one. My library does have some of her others, and I’ll definitely be keeping them in mind for future reading. The UK cover is a little better, less cliched anyway, and the US hardback cover is probably the most appropriate of them all. Seems like a great book. Sometimes and feel too that I’m overanalyzing a book because, but in the end , even if I’m being silly is great. I agree; it’s fun to think about what an author might be trying to do, even if my thoughts are way off-base. Sounds good — especially with the stamp of approval by you and Litlove! I enjoyed it very much, and I’m very surprised that Vickers isn’t read more. I’m glad it was more than you expected. I had a similar experience last year with a novel called Tapestry of Love by Rosy Thornton. Had it not been a British writer writing about the south of France I might have refused to request, but I decided to give it a shot. It was so much more than a simple romance, as the cloying title seemed to imply. Yes! I really enjoyed both of Thornton’s books that I read. This is similar to TTapestry of Love but a fair bit darker and less romantic. (To be honest, I didn’t care for the romance in Tapestry, but I liked everything else about it.) Her other book that I’ve read, Crossed Wires, is an even better example of the cover getting the book all wrong. Like you, I probably wouldn’t have been all that interested in this book based on the cover and title, BUT I really loved the quote you posted attributed to Ginger Rogers and the way Vickers used that as inspiration is really fascinating to me. I’ll have to look more into this one! It was definitely more interesting and rewarding than I would have expected, given the cover. I’ve heard Salley Vickers is good but I’ve yet to try her. I’m adding this one to my wishlist–thanks. I’d never even heard of her before this book, and I’m surprised. I think you’d like this quite a bit, Danielle. This is what I love about the book blogosphere! We can all get a recommendation for a book that we would never pick up on our own and we can learn that we are glad we did. I love that too. I’m sure I never would have picked this up in the bookstore!